Previously, when you ran out of health, you would simply fall to the ground dead and your only option was to release your Crow spirit. With these changes to the death system, you will instead find yourself unconscious. While unconscious, you are at the mercy of the battle raging around you. At any time, you have the option to release your Crow spirit (which will automatically release after five minutes), but if you do this you will lose the ability to be resurrected and instead your Crow will appear at a temple. In the field, your body will disappear and be replaced by a cairn that acts like a container for your tasty, tasty loot (the “how much” and “of what type” will be dictated by the world you are on), which can then be looted by other players. After respawning at the temple, you’ll be presented with two options: you can either fly through the world back to your cairn to recover your vessel (and whatever equipment is still there), or you can reclaim them from the safety of the temple. If you choose to use the temple, your equipped items will suffer a substantial durability hit; this is meant to be used as a last-resort! A downed teammate is a concern both for the course of the fight and for the likelihood that their inventory will be open to looting by your enemies. To pair with the new unconscious state, we also added resurrection. Circle of Life is a power that Clerics, Druids, and Templars will have access to through their Class. With this, you have the ability to rescue unconscious allies. Successfully resurrecting a downed friend will immediately bring them back to some health and allow them to rejoin the fray! This keeps their equipment from decaying and saves them the trek back to their cairn to reclaim their body. In order to successfully resurrect an unconscious ally, however, you must be in the Survival tray. Circle of Life also has a relatively long cast time — meaning that you’ll be vulnerable to attack while you’re attempting your rescue — and you can’t do it very often. Pulling off a resurrection in the middle of a raging battle will be dicey, so use this power carefully! 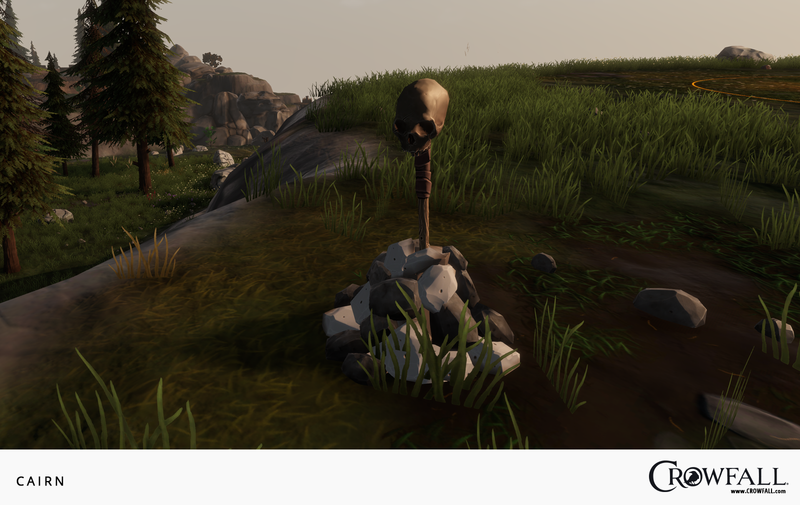 Crowfall is a game about conquest, and what’s a more straightforward way to advertise your victory than by taking the head of your fallen enemy as a trophy? In order to behead a bested foe, you’ll need an axe – the same kind of axe used to chop down trees. You’ll also need a bit of time; the strike isn’t instant, and will require a wind-up before you can deliver the coup de grâce. If you’ve satisfied these two requirements, you’ll be happily lopping off heads left and right. As with resurrection, the fact that a harvesting tool is required means that you’ll have to be out of combat mode to execute (pun intended!) this action – which is fraught with peril. In addition to the obvious benefits (it’s fun to take someone’s head! ), execution serves as a counter-point to resurrect; it’s risky and time consuming, but once you do it, it ensures the target cannot be resurrected and brought back into the battle. Any player can do it, provided they have the tool. When you behead a fallen enemy, you immediately release the Crow soul from their vessel, forcing them back to the temple (where, as noted above, they can elect to either fly back to their cairn or pray to the gods to recover their vessel at the temple for a significant durability hit to all items). This act will also create a unique item, a skull appropriately labelled with the name of the fallen combatant. In this first iteration, these skulls are purely cosmetic, acting as fun trophies you can sacrifice to the gods or store in your inventory or bank. In the future, you’ll be able to mount them on spikes for display in your Eternal Kingdom so visitors can know of your (mis)deeds! PvP isn’t always just about the combat itself; as we always point out, people think of “social ties” as being the friends you make in online games. In actuality, we believe that rivalries and competition can be just as important. We believe that the addition of this step between being bested in battle and death adds an exciting new layer to PvP encounters in the world. Having friends becomes even more important as a well-placed resurrection — while dangerous and rare — could just turn the tide of a battle. Similarly, having the opportunity to deny your opponents that possibility could be the final piece of the puzzle to claim victory. Some testers are already hard at work trying out these new states in the 5.5 patch on TEST. As usual, let us know in the discussion thread what you think about these mechanics, and show off any fancy skulls you’ve collected!